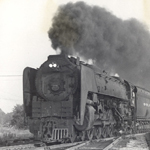 In the 1950s you would have seen three classes of NYC passenger steam Locomotives in Columbus, the 4-6-4 Hudson, the 4-8-2 Mohawk and the big 4-8-4 Niagara. 275, class J1-3 Hudsons were built, all but ten, by the American Locomotive Works in Schenectady, New York between 1927 and 1938. They had 79" drivers and a starting traction force of 53,500 lbs (10,900 of which was from the booster). Eleven of the Hudsons were streamlined in 1938 for use on the New York - Chicago named trains such as the Twenty Century Limited. Hudsons were also used on the T&OC when it had passenger trains. The Hudsons were the most common passenger Locomotive on the NYC from the 1930's to the end of steam in the mid 1950's. The class L Mohawks were built between 1916-1943. The early class L types were built as freight only locomotives. Starting in 1940 some L-3 and the L-4 Locomotives were designed as dual service locomotives and used for heavier passenger trains especially for troop trains during World War II. There were 65 L-3 and 50 L-4 locomotives. Some were equipped with very distinctive smoke deflectors often referred to as elephant ears. The L-3 had 69" drivers and the L-4 had 72" drivers. Their starting traction force was approximately 60,000 lbs. There are two Mohawks preserved in museums, L-2d No. 2933 in St. Louis and L-3a No. 3001 in Elkhart, IN. There were only 27 class S Niagara locomotives. They were built in 1945 and 1946. Although reports stated that they were a superb engine they met a premature date with the scrap dealer due to dieselization. Once the Ohio State Limited was dieselized I don't think the Ohio Route had a need for an engine with the heft of a Niagara although I do have one picture below of a Niagara with the Cleveland Mercury. S class locomotives had 79" drivers and were rated at 6600 horsepower. They were capable of scooping water at 80 mph a sight I wish I had seen. The slide show gives some flavor to what was seen around Columbus in the mid-1950's when the NYC ran 9-12 passenger trains a day.